Officials are advising patients who visited the facility between December 19, 2015 and October 19, 2016 to get tested for hepatitis B, hepatitis C, and HIV. Health officials are warning patients at a dental office in Berks County after they say they found dead mice and insects near the office’s sterilization unit. The Pennsylvania Department of Health say an investigation determined the Center for Family and Specialty Dentistry on 2642 Bernville Road in Reading, Pennsylvania did not follow appropriate infection control procedures to properly clean, disinfect or sterilize devices. Officials are advising patients who visited the facility between December 19, 2015 and October 19, 2016 to get tested for hepatitis B, hepatitis C, and HIV. "While we haven't received reports of hepatitis B, hepatitis C, or HIV from patients, infection control procedures at this practice were inadequate and created the potential for harm, so we're recommending patients get tested," said Health Secretary Dr. Karen Murphy. "We prefer that patients receive information regarding their health directly from their provider. However, in this case, that did not happen, so we've contacted patients of this practice directly." The health department sent a letter to the facility to cease and desist all patient care back on October 21. The practice remains closed as the investigation continues. On November 4, the Pennsylvania State Board of Dentistry temporarily suspended the dental licenses of three dentists who worked at the facility, Dr. Stephen Sulzbach, Dr. Eric Osmolinski, and his wife, Dr. Jana Osmolinski. Osmolinksi’s lawyers told NBC10 he has not been notified of any infections or serious problems by his patients. Osmolinski and his wife also run a dental clinic in La Jolla, California and are in good standing in that state. The couple’s lawyers say they were managing their Reading, Pennsylvania office from California and visiting twice a month. Marie Kennedy, a former office manager at the office and mother of a patient at the practice, told NBC10 she was fired for speaking up about the unsanitary conditions. “There were dead mice next to the sterilization unit,” she said. “The instruments were not clean because they were always wet. They never went through a dry cycle. 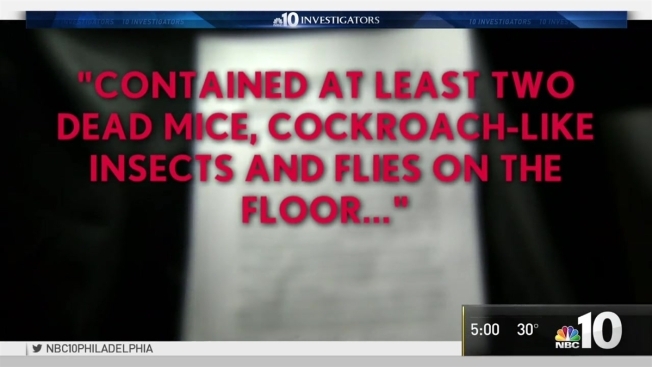 Health officials say they found at least two dead mice, cockroach-like insects and flies on the floor of the office’s basement where instruments were sterilized. State investigators also say they found expired medications inside the dental office. Any patients at the Center for Family and Specialty Dentistry can call 1-877-PA-HEALTH (1-877-724-3258) for more information.